Developing a bot is similar to developing any mobile app. Your bot should provide an engaging, delightful, and useful experience. But most importantly, bots that focus on doing a small set of things, and doing them better than anyone else, will be more successful than those that try to do too much. To help you achieve that focus, here are 10 steps to building a great bot UX (user experience). Before you design your ideal bot UX and ultimately build one, you must outline your strategy. The same applies for any kind of new application: A strategy starts by identifying a user problem that you think you can solve. And if by solving this problem, you see a business opportunity, you’re off to a good start. A problem drawing exercise can help. Draw a problem on a whiteboard with the intent of visualizing the problem so your team can talk about how the bot could solve it. Many potentially game-changing products have failed because the teams responsible for them did not identify the key performance indicators (KPIs) up-front. Your bot should impact your business in a positive and measurable way. Your success metrics will guide the design and features of your bot, and allow you to analyze if your bot is meeting the business objectives. Capture persona groups and develop user stories before you define your bot’s features. The goal is to define who, exactly, the chatbot will interact with and “serve.” You need to truly understand your target users’ feelings and needs so you know exactly why (and how) the bot will enrich their lives. 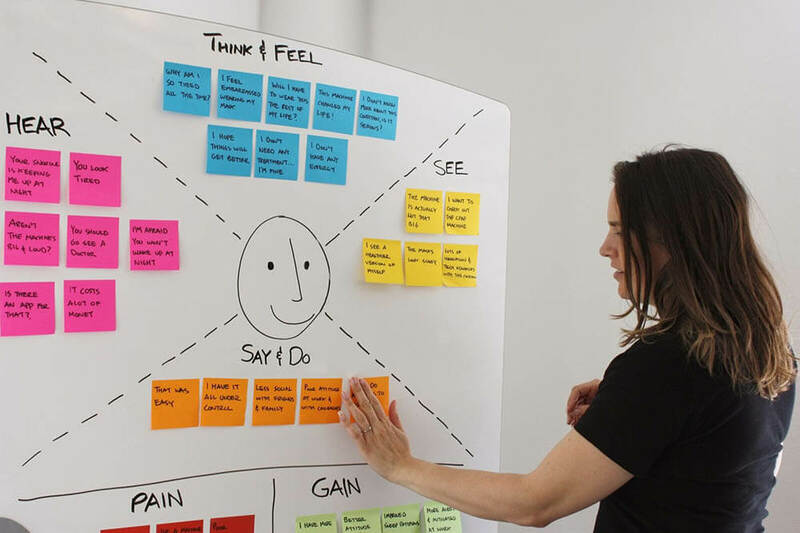 We like to perform empathy mapping exercises with our clients (shown below), where we fill out sticky notes with real customer beliefs and motivations, then organize these into six categories illustrating the customer’s environment, behavior, concerns, and aspirations. We then define user stories: brief statements that identify target users and their specific needs. The difference between a user story and a persona group is that the story is specific, whereas personas tend to be more general. Often there are several user stories associated with one persona group. Is there a campaign on a messaging platform already running that you must consider for this bot? Which photography or illustration style best represents the company within the mostly text-based universe of bots? 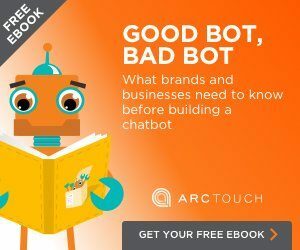 What “brand voice” and personality (see step 8 for more) should your bot have as it interacts with customers? The messaging platform you select will depend on your business objectives and your target audience. When we build bots, we help clients select the ideal platform, as well as recommend solutions that help you easily deploy the same bot to multiple platforms. Here’s a quick synopsis of the top platforms you’ll likely be choosing among, including reported statistics on usage. In addition to consumer platforms, there are also some established workgroup-oriented chat platforms that present the opportunity to develop enterprise bots for employees (like we did with our iHaveIt bot). These include Slack, HipChat, and Flowdock. Will the bot require typing or provide a set of buttons for the person to tap? Can users communicate with the bot using speech? What about photos and image recognition? Right now, there are a few basic types of conversational interfaces. There are voice assistants, which you talk to, and there are bots, which you “type to” or tap on choices presented to you in the course of your “conversation.” As the technology evolves and gets smarter (see the next step), there will be ways to blend voice technology with bots that require users to type/tap. Whenever users interact with your bot, it presents an opportunity to begin or deepen a relationship. You want the bot to engage in a human-like way. The challenge is that there are no standards for how bot conversational flow documentation is produced. Some agencies use the same approach as linguists: the sentence diagram. At ArcTouch, we’ve created a bot design template in Sketch to clearly capture and document conversation flow paths. You can download the bot design ux template for free here. Our approach is a few steps removed from the traditional method of sentence diagramming, where the diagrams are organized by how words in sentences function and relate to each other. For chatbots, we need a method of breaking up a sentence into its parts, and documenting the variety of responses a user might have. A question-then-answer structure is an easy way to organize the flow in the conversation — and is the foundation for our new bot conversation flow format. Your bot’s personality should tie in directly with your brand. You may want to start by choosing a name for your bot. You should create a bot character with a style that represents your brand values. Some successful bots use humor or colloquialisms to put people at ease when they are conversing with the bot. When done right, this helps the bot be both useful and delightful — a key combination for a successful app or bot. A good example is Botsworth, Kik’s developer bot, who is a dignified helper able to offer ways to find information and guidance while developing a chatbot on the Kik platform. Immediately after user scenarios and use cases are defined and a prototype is created. This step is iterative, meaning that if you’re reworking the scenarios, applying client feedback and learnings from the previous test, you should test each time you make updates to ensure the feedback is helping simplify the bot UX and align with the product KPIs. After conversational UI paths are developed, applied to wireframes, and the prototype has been updated. If step 1 (the problem has been defined) is done correctly, almost all decisions regarding user task flows would have been solved, but new questions about brand, tone, and conversational style may need to be reviewed. After the product has shipped. This is a great opportunity to refine, optimize, and support the growth of your chatbot. We’d normally use analytics and create A/B tests to help define and outline proposed updates, but with less-developed analytics functionality for many chatbot platforms, we may have to get creative. Facebook says it will offer analytics for Messenger chatbots soon, and you may see more services like Botlytics popping up to fill the void. As I mentioned above, getting continuous feedback and doing testing over the life of your bot will help it evolve and improve. Of course, you can’t get feedback without users — and you can’t get users without promotion. If you’re an established business or brand, make sure to target your existing customers and users and focus on the complementary service the bot will offer them. To acquire new users, create a landing page on your website for your bot so that visitors will find out about it — and you might even choose to support your bot with a paid search campaign to drive some keyword traffic to that page. Depending on the platform you choose, spend some time understanding how bot search works and how adding keywords to a description — or even a promo video — might help. In the meantime, as with many other types of apps and software, remember that “shipping” isn’t the end, but really the start of the journey. Listen to your users and make sure you have plans to iterate over time. Although it may seem obvious, users must be at the heart of good UX design — no matter what application or system you are creating. Always start with your users. Who are they? What do they want? How will your bot help them accomplish something they want to accomplish? When you put users first in designing your bot UX, there’s a much greater chance you’ll end up with something they’ll want to use. And if it’s truly useful and enjoyable, they’ll keep using it. Ready to get started? Have an idea for a bot? We’re happy to help. Contact us and we’d be happy to answer any questions and share our insights on what makes a great bot. Anthony Hall - Anthony Hall is the VP of Creative at ArcTouch. When he's not designing beautiful apps, you might find him playing the "beautiful game" (soccer).